Burundians carry their belongings in Bujumbura, Burundi, Nov. 7, 2015. Carrying their prized possessions, scores of people have fled Burundi’s capital before a security crackdown. U.N. human rights officials call the deteriorating political situation in Burundi explosive, and warn the Central African country is slipping down an ugly slope. The United Nations is urging that greater international pressure be put on the government to stop the violence and prevent a regional conflict from breaking out. Until now, the situation in Burundi mainly has been a political crisis. Observers say President Pierre Nkurunziza - who won a disputed third term in July - is determined to do whatever it takes to remain in power. U.N. human rights officials say they worry that this situation could rapidly turn into an ethnic, as well as a regional, conflict. Scott Campbell, chief of the Central and West African section of the U.N.'s human rights office, says recent statements by Rwanda's president, Paul Kagame, invoking that nation's 1994 genocide, show his concern about Rwanda being drawn into the Burundi crisis. Campbell says growing violence and human rights abuses since April, when Nkurunziza declared he would run again, have forced 280,000 people to flee their homes. He says 200,000 have gone to Tanzania, Rwanda and the Democratic Republic of Congo. “In the DRC, there are refugee camps, very close to the border, a number of kilometers from the border between Bujumbura and Uvira [DRC] area housing refugees...We have very serious concerns that these camps are being used both as recruitment grounds for armed groups, but also by the Burundian authorities to identify opponents and threaten them,” said Campbell. 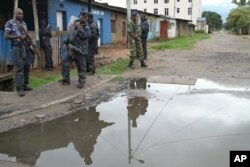 Burundian police and soldiers guard a deserted street in Bujumbura, Burundi, Sunday, Nov. 8, 2015. Rising violence in Burundi is sparking calls for greater international attention. The United Nations documented 510 human rights violations last month in Burundi, including 55 extrajudicial killings, up from 40 in September. Campbell says he blames security forces and allied militia groups. He says there were 52 documented cases of torture and around 400 cases of arbitrary arrests and detentions in October. He also says more international pressure must be brought to bear upon Burundi’s president to prevent the spread of violence. Campbell is urging the U.N. Security Council to take strong action that could include sanctions, freezing individual assets of those who incite or engage in violence, and travel bans.